PBOT backs off from attempt to save on-street parking at Northeast Portland housing project, but will not change policy. Portland has settled a legal challenge to a year-old duplex driveway policy with a local, family-owned homebuilding company. After months of delays and financial losses, Valhalla Custom Homes has been issued the permits it needs to build its original duplex design with two driveways and garages. The Portland Bureau of Transportation denied the original application last December, saying that a rule it adopted without public notice or input requires most new duplexes to be served by a single driveway to save on-street parking. The small company put all of its work on hold until the dispute was resolved. Fighting the city cost $460,000 in additional interest, attorneys fees and lost income, according to lead designer and general counsel Mari Ives. "There is no denying the complexity of the legal issues involved in Valhalla's dispute with the city. 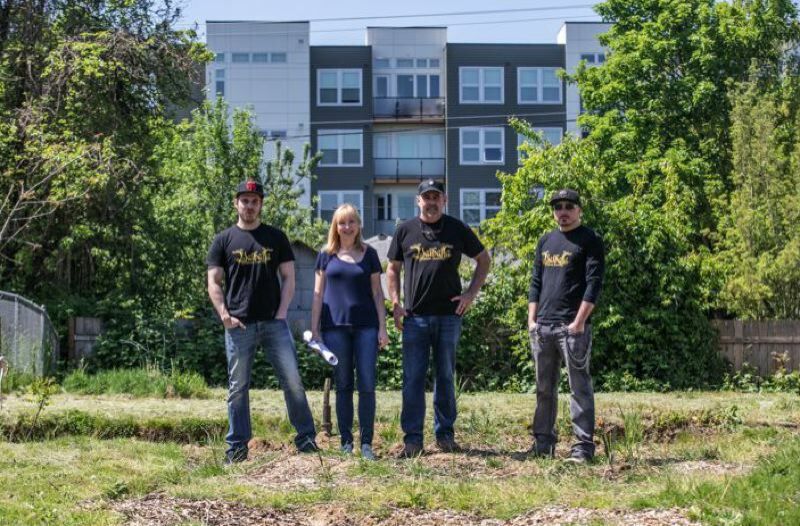 It is this complexity which has provided PBOT the opportunity to impose conditions on the grant of driveway permits beyond its actual authority," says Ives, the wife and mother of the company's co-owners, who are her husband, Gary, and their two sons, Chris and Jonathan. The company had challenged the rule before the Oregon Department of Land Conservation and Development (DLCD) by seeking a rare order to prevent the city from enforcing its one-driveway policy for most new duplexes. PBOT settled the challenge in the middle of the hearings process, in consultation with the City Attorneys Office. The settlement does not admit any wrongdoing and prohibits the company from suing for damages. The Portland Tribune first reported on the dispute on May 15. The one-driveway policy was adopted by PBOT's Development Review Division on May 31, 2017. It is headed by Kurt Krueger, who insisted the policy is not actually new, but merely a more formal statement of PBOT's longtime preference for single-driveway duplexes. The goal is to preserve as much on-street parking as possible, which is becoming increasingly important as Portland grows. "We allowed a lot of exceptions in the past, but now more and more housing is being built, and the demand for on-street parking is increasing. We're not creating a policy, we're clarifying a policy," Krueger said at the time of the original story. Ives' company was not aware of the pending policy in late April 2017 when it purchased the property for a duplex at 4205 N.E. Rodney Ave. It only learned of the policy when PBOT denied its request for two driveways in December 2017. Complying with the new policy would have required a complete redesign of the proposed duplex, something the company was not willing to do because it does not believe buyers want duplexes that have the "funnel" shared driveway required by the policy. But more than that, Ives did not believe PBOT had the authority to adopt the policy in the first place. She argued it violated state land-use planning laws that require governments to have clear and objective building standards. The one-driveway policy imposed design requirements on builders that are not set forth in other construction codes, including additional setbacks to accommodate the funnel-shaped driveway, she said earlier. The company hired Portland land-use attorney Gregory Hathaway to represent it before the DLCD. He sent the agency a request for a hearing by certified mail on Aug. 22. State staff sided with the city and scheduled a proceeding to decide whether a contested case hearing was necessary. Hathaway was prepared to counter the staff's finding when the city made the settlement offer, which the company accepted. "In consultation with the City's Attorney Office and with the Oregon Department of Land Conservation and Development, PBOT is revising its December 1, 2017 decision," reads the Sept. 27 settlement agreement that approves the two-driveway design. Because of the terms of the settlement, the policy could still be applied to most of the potentially new duplexes that would be built throughout Portland if the City Council approves the most recent Residential Infill Project project recommendations. "Everything that we have learned through this process has convinced us that PBOT is creating and implementing rules on its own that do not comply with the state requirement that only clear and objective standards in the city's ordinances be applied," Ives says. The company already has demolished the small house that was on the property and hopes to begin construction soon. Ives says the final sales price will likely be higher than originally planned because of the expenses incurred during the dispute.